In Ep. 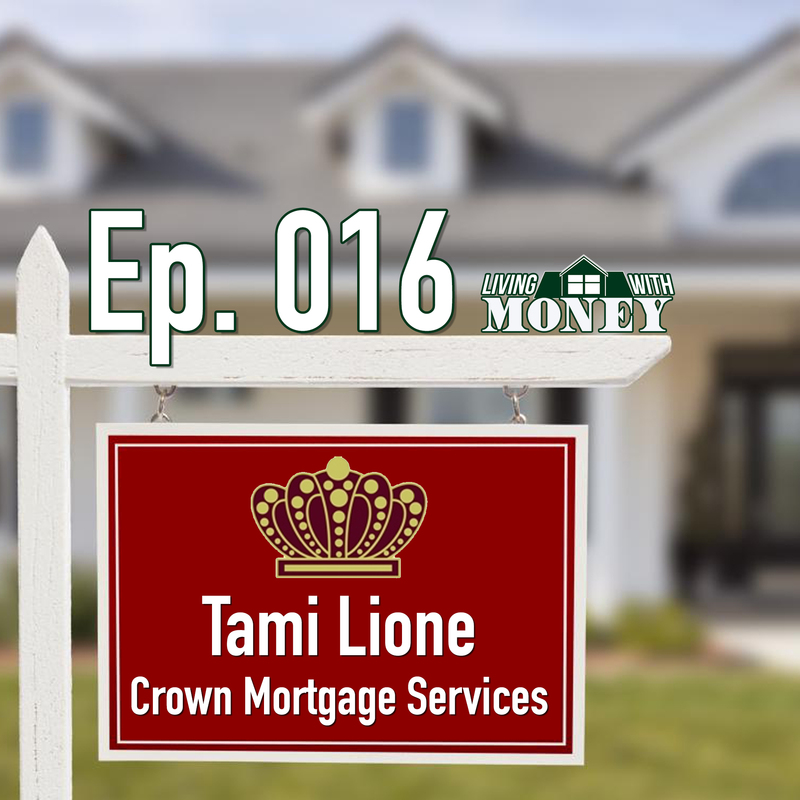 16, Tim talks with Tami Lione of Crown Mortgage Services. They talk about how the mortgage business has changed over the 25 year history of the company, the ins and outs of getting a mortgage, refinancing, and much more. They also discuss Tami’s role as co-chair of the Women In Business group within the Jersey Shore Chamber of Commerce, and what the group means to her. Tim Mullooly: Welcome back to Living With Money. This is Tim Mullooly. On today’s episode, I’m joined by Tami Lione from Crown Mortgage Services. Tami, thanks for coming on. Tami Lione: Great to be here, Tim. Tim Mullooly: A little background on Tami, do you want to tell the listeners about yourself and what you did in life before Crown Mortgage Services? Tami Lione: Sure, if I could remember back that far. It was a long time ago. Yeah, I basically started my career selling real estate after I graduated high school, and I got a great job working on the trading floor on Wall Street at Oppenheimer. I did syndicate equity, and I worked there for many years, and it was a fantastic job, but yet it was a job. I had an opportunity to open my own company based on the way they would cart you off the floor when you were no longer needed on the trading floor. I thought that it was time for me to consider my future and to do something that was going to be putting me in charge instead of them in charge, and Crown Mortgage was born. Tim Mullooly: … you wanted to start something that was more solidified and that was more in your control? Tami Lione: Absolutely, because, I mean, again, as great as an experience as that was, at any time, you’re expendable. There would be people who worked there for 25, 30 years and gave up their whole life for the firm or for the company or for the cause, and when your time came, you were literally carted off the floor. I would see that on a daily basis and just felt like I didn’t want that to be me 25 years out. Tim Mullooly: You said you started selling real estate for that. Is that how you got started in the mortgage business? Tami Lione: I got my real estate license shortly after graduating high school and learned about the real estate, learned about the mortgage end of the business. Again, got an opportunity to go work on the trading floor, which isn’t something that comes along each day, so I felt like I needed to take that but, again, based on my experience there, I decided that I was just going to go back to, really, I guess what you would call my first love, which was real estate and mortgages, so that’s what I did. Tim Mullooly: … at Crown Mortgage. Tami Lione: … and 25 years later, here we are. Tami Lione: I was 25 when I opened up the company in 1993. It was a leap of faith, and at 25, what really do you have to lose? I took it, and here we are. Tim Mullooly: 25 years in, I’d say it worked out pretty well. Tami Lione: Yeah, I would say it worked out pretty well, all things considered. Again, it might’ve worked out well where I was, but at the time, I just felt that if I was going to invest in something for 25 years, it should be in myself, so. Tim Mullooly: What kind of services do you guys offer clients at Crown Mortgage? Tami Lione: We basically … I’m licensed in four states, so we could lend money in New Jersey, Florida, Pennsylvania, and New York. Basically, we do residential loans for mortgages, purchases, refinance, equity loans, if you needed to do cash-out for a debt consolidation. Basically, we’re able to handle anything that’s residential. We also have a business lending side of our business, which we lend money to businesses. Tim Mullooly: If someone needs to refinance their mortgage, they can come to you, or if they’re buying a house or selling a house as well, and you handle pretty much all of that? Tami Lione: Yeah, pretty much. If somebody’s looking to purchase, they need a preapproval letter, which is normally what you need to submit an offer, they would come to me. I would qualify them, and I would see how much of a mortgage loan they would qualify for, and basically on the purchase end of things, that’s the way it’s done in the beginning. On a refinance, people have all sorts of different reasons. Their rate may be too high. Their rate may be adjusting. They might want to term down. On a refinance, there could be different reasons why they would want to benefit from it. Tim Mullooly: I feel like a question you might get asked a lot is, “Is now a good time to refinance a mortgage?” With rates are always moving around, what would you say the current climate is for refinancing, or is it different for everyone’s situation? Tami Lione: Yes. It is different for everybody’s situation because rates are live, and they’re fickle, and sometimes they’re bipolar, so that’s the way the market moves. Of course, there’s a lot of forces out there that make the market move in crazy directions, but for the most part, rates are historically low. If you’re purchasing, rates are still historically low. On a refinance, somebody might still be paying a 30-year loan, let’s say, for example, and they’re already 17 years into the loan. Someone like them could benefit from terming down to a 15-year loan. It’s really very personalized to someone’s situation. Sometimes you have the opposite effect. Somebody might be paying on a 15-year loan, and now that payment is just too steep for them, and maybe a life situation happened to them, they have to pay for college, and they need to go back to a 30-year. On a refinance, there could be many different scenarios that somebody could benefit from. Tim Mullooly: I know personally for me, about a year and a half ago, I was debating whether or not to buy or rent a place just out of college. I feel like there’s always a debate going on if it’s better to buy or rent. What do you say to someone, things to consider between buying and renting a house. Tami Lione: Well, for starters, you get a tax write-off with purchasing your own property. You don’t get that with a rental. Believe it or not, in this area, rentals are quite high. If somebody is in a price range of, let’s say, maybe 300,000, let’s say, they may potentially be paying the same amount or less in purchase than they would in rent. The benefit obviously to owning your own home and getting the benefit of a write-off versus just paying rent, that alone is a good reason to purchase versus rent. There are some situations where if somebody’s paying $2,500, let’s say, or three grand sometimes in rental monies, they certainly could get into a home for that. Tim Mullooly: Right, yeah, and building equity as well in a house. I feel like you’re paying either a rent payment or a mortgage payment, but with a mortgage, you’re actually building equity, and it’s yours. Tami Lione: No, and you don’t really have any … If you’re paying rent, obviously, you don’t really have any personal interest in it, where, a home, to your point, its values go up. I mean, do they go down? Yes, of course, but it’s your home. The average amount of time that somebody spends in this area or when they’re purchasing something would be somewhere between five and seven years, so depending if you have children in the school system, you might be there for 15 years or even 17 years. Chances are, what you purchased it for all those years ago, there’s going to be value there, plus especially if you’re on a 15-year loan, you would be paying down the principal balance a lot quicker. Tim Mullooly: I know something that I realized during the home-buying process was that first-time home buyers can put down significantly less for a mortgage for a house. We have something called PMI on our mortgage since we put down so little. For people out there who might not be aware of what PMI is but maybe have heard of it before, could you describe what that is? Tami Lione: Yeah. You could purchase a property with a FHA loan. It could be 3.5% down. You could put 5% down, you could put 10% down, you could put 15% down. If you put anything less than 20% down, you get what’s called PMI. If you put 20% down or more, then there is no PMI. PMI is private mortgage insurance. Basically, depending on your loan amount, it could be a couple hundred dollars a month that you need to pay in your mortgage payment for not putting the 20% down on the property that you’re purchasing, equity-wise. Tim Mullooly: After a couple of years, though, that PMI can be taken off of the mortgage, right? Tami Lione: Yes, but it doesn’t really just fade away into the sunset. Normally, what will happen with PMI is it’s on there for X amount of years, and then it needs to be refinanced off. Normally, the benefit to that as well is your rate might’ve been higher at the time, so you might be killing two birds with one stone by being able to lower your rate or lower your term, and also dropping PMI, but to drop PMI, you have to also have an appraisal that shows that there is at least 20% equity between what you owe and the value of the property. Tim Mullooly: Since you guys have been around for 25 years, I feel like, obviously, you have a good amount of clients coming in the door. What kind of marketing have you done over the 25 years to sustain such a great business? Tami Lione: You name it, we’ve done it. Back in the days when people actually used to read the newspaper, that was always a good source of advertising, but times have changed with that, so we do a lot of social media, we do a lot of consumer direct. Again, we’re licensed in four states. To advertise in every newspaper in four states wouldn’t be the best use of funds. Obviously, we have a huge referral base because we’ve been around so long. I find myself doing loans for people’s grandchildren. I did their loans, and now I’m doing it for their grandchildren, which is a little disturbing because that goes to show how old I’m getting, but that, for us, is a great feeling because they trust in us, and now they’re trusting us with their family members. Basically, I would say direct to consumer, obviously, social media, word of mouth, and referrals from clients and from our base. Tim Mullooly: Tami is also the co-chair of the Women in Business group? Tim Mullooly: How did you get started doing that? Tami Lione: … and they had a person who was on the Women in Business, and they were not going to be chairing it anymore, so they had, I spoke to them about it, and they had asked if I would be interested in co-chairing the Women in Business. Being a woman in business, it seemed like it would be a perfect fit for me because I do spend a lot of my time not just promoting Women in Business, but everybody’s business. I like to be able to connect people, so I thought that this would be a perfect way to do that. Tim Mullooly: What are the different types of events that you guys put on for the Women in Business group? Tami Lione: Well, for the Women in Business, we meet four times a year. Again, the chamber’s very active, so they have, there’s something in it for everybody. We basically do four times a year, and we will plan it at a restaurant or some member of the chamber’s organization, and we will host it there, basically, it’s just a big networking hour or two. Everybody comes in. They say what they do. We exchange cards, and we just try to empower each other to help promote each other’s business. Tim Mullooly: That’s awesome. What would you say to someone who might be hesitant to or looking to join the chamber of commerce or the Women in Business group? What would you say is the main benefit of doing that? Tami Lione: Again, the Jersey Shore Chamber is a really outgoing chamber. I find them to be very inclusive. I’ve been to a lot of groups over time. I’ve been to a lot of events. They’re, by far, the friendliest members. They’re always trying to help each other out. When people come there, they feel welcomed. They don’t feel like they’re walking to a room of strangers. They might initially, but there’s always someone to greet them, there’s always someone to include them. In the Women in Business, I, as a chair person, I’m always sure that when somebody comes in, especially if they’re new, I want them to be comfortable because I want them to come back. Tim Mullooly: I can definitely attest to that. I recently had started going to the Coffee Connectors at the breakfast meetings for the Jersey Shore Chamber of Commerce, and I was essentially a new person going there. I met you there and met a handful of people who have been on this podcast, and so I can agree. That chamber is definitely outgoing, and I really like that about it. They’re welcoming to new people. Tami Lione: Yeah. I mean, I really feel like, especially if somebody who might be a little bit nervous or afraid of meeting new people or just a little shy, honestly, when you come to these events, whether they’re Coffee Connectors or Women in Business, there’s always going to be somebody there who’s going to make you feel welcome. Tim Mullooly: Just listening to people talk in the chamber about all the different business that they do with people in the chamber, it really shows that people that are involved in the chamber like to support local business, and everyone in the chamber supports each other. Not only do you get to meet great people, you also get to find some business and find some great businesses out there that can help you as well. Tami Lione: Absolutely. I think that’s kind of what really makes the world go around, especially in a local area. There’s no greater compliment than a referral. When you have business dealings going on with people within the chamber, and you do something right for them, or you solve a problem for them, they’re the first ones to give you a shout-out and really thank you for your work. Tim Mullooly: Right. If someone comes to work with you at Crown Mortgage Services, what’s one thing that you would want them to remember you by? Tami Lione: I would like to think that they would feel that they were mentored or that they had a casual but productive work environment, if they moved on that they learned something. Tim Mullooly: The mortgage business is something that a lot of people deal with but might not understand too much. Do you like to at least try and educate the clients a little bit as to the whole process, or do you like to just take care of it for them? Tami Lione: No, to me, I find that the more educated a client is, the easier my job is. Not to put myself first, I’m not, but the more they know as we’re going through the process, they don’t feel uneasy about it, they don’t feel like maybe they didn’t understand what was going on. I want them as educated as possible so that they’re completely comfortable with the process by the end of the day. Tim Mullooly: … feel that? Tami Lione: Yeah, I do. I agree with you on that because what happens is that when they’re empowered with what’s happening in their own world, and they’re not just being told what to do, but they’re being explained how the process works, then they could advocate for themselves, and they don’t have to feel like, “Oh, I left that meeting, and I felt uneasy,” or, “I didn’t feel so good about that.” When someone leaves, I want them to feel completely comfortable. Tim Mullooly: We’re going to shift gears a little bit. I got a handful of questions that we like to ask all the guests that come on here, first one being how would you define being wealthy? We’ve gotten a lot of different unique answers. Everyone has their own take on it, but what does being wealthy mean to you? Tami Lione: Well, I think wealthy’s kind of a state of mind. I think that that could be, of course, put 10 people in a room, and they’ll give you 10 different answers. I think that wealthy is really what’s important to you. If health is important to you and you’re in good health, then you feel wealthy. If family’s important to you and you have a great family, then you feel wealthy. The least thing that I think that it’s about for me is money. Money doesn’t make me feel wealthy. What makes me feel wealthy is to have a happy life, to have good people in my world, to have good friends, to have good business associates, and to me, that would be what made me feel wealthy. Tim Mullooly: Going back over your career, is there one piece of advice that you wish that you had when you started your career, going back to the very beginning? Tami Lione: Back to the days of Flintstones, right? Tim Mullooly: Yeah, when you were 10 years old. Tami Lione: Yeah, when I was 10 years old. Tami Lione: Yeah, I mean, I think that you should think big and that you should never be driven by fear. That being said, don’t be afraid to stay small or think small. You have to really just go for it and not let fear get in your way. Tim Mullooly: Something that kind of popped into my head along the way, after 2007, 2008 and having gone through so many years, how’s, if at all, how’s the mortgage business changed since you first started doing it? Tami Lione: Well, in some ways, it changed dramatically with regulations and things of that nature, but in other ways, it’s really the same basic steps. It’s still the same basic steps. You still have to qualify someone. Someone still has to meet the guidelines. The transaction has to be right for the client. They have to be comfortable with the payment, not just affordable, but comfortable with it. I think those steps on doing proper due diligence with somebody is probably the same, but dramatically different from when, basically, you just needed to have a pulse to get a loan. Nature has a way of cleansing its health, and those types of things weren’t necessarily good for the economy or for the people. In some ways, those changes are good. Tim Mullooly: … what has their mindset been? Tami Lione: I find that their mindset changes dramatically once they get married and have children, so I guess that’s whether you’re 25 or whether you’re 35. It’s the renting, the studio apartment in some fancy highfalutin area. It’s fantastic, and it’s a great way to live except when you have twins. Tim Mullooly: Right. Yeah, exactly. Tim Mullooly: Priorities change a little bit. Tami Lione: Your priories change. I think that although millennials are a group of people who were born during a certain age, certain years, that you might be a millennial at 25, but at 27, you might find that, yeah, I just got married and I’m having a child. I think it’s all about priorities and where you are in life. Tim Mullooly: Right. It’s not necessarily just about millennials doing this or this generation doing that. It’s just more about when people’s priorities change during their life and at whatever age that is. Tami Lione: Yes. I think so. Right. Tim Mullooly: Like you’re saying, you can be a millennial, but if you all of a sudden get married and have children, you’re going to most likely want to buy a house and settle down. Tami Lione: Now you’re no longer a millennial. Tim Mullooly: Exactly. Yeah. Right. Tami Lione: But I think that’s what it’s like. I try not to be too, to categorize people in that way because I just think that everything to do with mortgages or real estate, it’s life events, really. It’s life events, just like people, when they’re empty nesters and their children are off to college and they don’t need the five-bedroom home. Are they considered baby boomers? I don’t know. I just say that they’re considered that at this time. This is, a life event has happened, and now they’re ready to change. Tim Mullooly: You deal with a lot of people who are buying their first homes. Do you deal with a lot of people that are buying retirement homes? You said that you’re licensed in four states. Tami Lione: It’s New Jersey, New York, Pennsylvania, and Florida, and I do a lot of second homes and retirements, being of retirement in, of course, Florida because there’s not too many people who go to retire in Upstate New York. Tim Mullooly: That’s true. That’d be an odd place to retire. Tami Lione: … usually retires north. Some do, but most don’t. Most head south. Tami Lione: Yes, absolutely. They want turnkey. They’re over it. They’re done with the lawn. They’re done with the gardening. They’re done with cleaning the pool. Basically, they just like to go to, it could be a condo, it could be a 55 and older community where basically they’re paying a maintenance fee and everything is done for them. They just have to pick up their towel and go to the pool, or if they’re living on a golf course, just go play golf. The young’uns who are first-time home buyers are ambitious, and they’re young, and they haven’t been worn out yet by home ownership. Tami Lione: Absolutely. They’re into raking the yard and planting their first garden and growing their vegetables. Basically, that’s more appealing to somebody who’s a first-time home buyer. Tami Lione: So talk to me when you’re 55. Tim Mullooly: … in 30 years. Tami Lione: … and see if you still want to do that when you’re 55. Tim Mullooly: Yeah, because all the projects that we saw in the house, it looks interesting to me. It’s like, I can figure it out, or I’m interested in at least taking part in fixing that or changing that or whatever, but definitely makes sense the older folks not wanting to that anymore because they already did that. Tami Lione: They’ve already done it, and truly, they’ve raised children, they’ve possibly raised grandchildren. They’ve been at that game a long time, and now they’re just looking for what I say is turnkey operation. Tim Mullooly: Yup. Last question that we have for you today. What would you say is the thing in life that you’re most passionate about? Tami Lione: Well, I think I’m most passionate about making a difference in somebody’s world. That could be on, it’s not just the business level. I really like to make people laugh, and I like to make them feel good about themselves after they maybe had a conversation with me because life could be real heavy. If I’m able just to turn the frown upside down, even if it’s a brief moment out of their day, I really like to leave people with a good feeling after they’ve spoken to me. Maybe they got a chuckle or two, and that kind of helped them through the day. I’m kind of passionate about trying to make people feel good. Tim Mullooly: That’s a great thing to be passionate about. Like you said, there are a lot of dark things in the world, so someone interested in making people smile is always good. That’s going to do it for all the questions that we had today. Tami, thank you for coming on. It was a pleasure talking to you. Tami Lione: This was awesome. I really do appreciate you inviting me. Tim Mullooly: Yeah, anytime. If you’re looking to buy a house, sell a house, refinance your mortgage, anything mortgage-related, get in touch with Tami. We will link to their website, their Facebook page in the show notes so you can get in contact with her. Also, if you’re, happen to be at Jersey Shore Chamber of Commerce event or a Women in Business event, say hi to Tami. She will try and make you smile. If you’re listening to this on iTunes, please subscribe to the podcast to get new episodes every week, and feel free to leave us a review or a comment because it would really mean a lot to us. Be sure to follow us on Twitter and Instagram, @LWM_podcast for more news and updates about the show. If you have a question that you’d like us to answer on Living With Money, get in touch with us. You can email us at LivingWithMoneyPod@gmail.com. You can find us on Facebook and send us a message there, or you can tweet at us on Twitter, shoot us a message on Instagram. We’d be happy to answer any of your questions.